Clubby the bear is one of a kind ! 1. 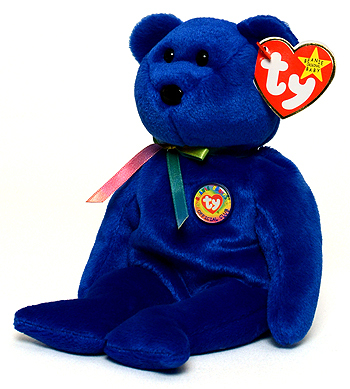 Clubby was only available to members of the Beanie Babies Official Club (BBOC). 2. 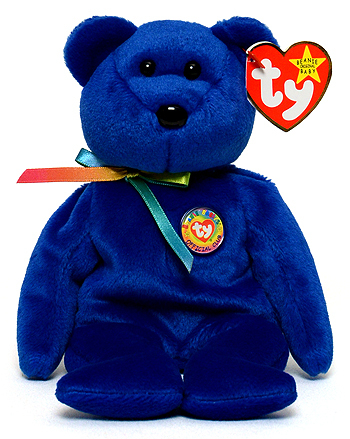 Clubby was the first bear to wear a button on its chest. 3. Clubby's 6th generation tush tag came in three variations. At the upper right side of the Ty heart emblem on the front of the tush tag, there was either the number 01, 02, or 03. It is unclear what the different version numbers represented. 1. Clubby missing the button on its chest. 2. Clubby with its button upside down & on the wrong side of its chest. 1. The counterfeit version eyes and head are smaller than on the authentic version. 2. Ribbon on authentic Clubby is tie-dyed. Counterfeit has red ribbon made of wrong material. 3. BBOC button on the counterfeit looks more orange. Authentic Cubby BBOC button contains more pink. 4. The BBOC button looks like it is attached to the surface instead of imbedded in the fabric. 5. Blue plastic around the counterfeit BBOC button is more visible than the blue on the authentic version.